"If you could invite five people to a dinner party, dead or alive - family and friends excluded - who would you invite and why?" This was a question that was posed to me and seven others at a dinner party a few weeks ago. The irony. As the first guest began to comment, I sat there, dumbfounded. It was a really good question, but one that requires more than five minutes to think about. Then I started to fidget. "Albert Einstein, because he was…". My pulse started to race. I started to perspire. May I reiterate that FIVE minutes isn't enough time, folks. "…Jim Carrey, mainly because he..." Okay, think Jenny. Think. Who would you - wait. Jim Carrey? Really? As this went on around the table, I realized I had no idea what half the people said because I was too focused on what I was going to say. Thankfully, I was the second to last person to be asked, so technically I had more than five minutes to prepare myself. Can I just add that I couldn't even imagine throwing a dinner party where these said people were in attendance. I'm not sure my cheese and pineapple on a stick or sausage rolls would suffice. I'm freaking out when I have to cook for my own friends; people that eat my cooking regardless, but to cook for the likes of them? People that have (probably) been privy to some of the world's best food? Total. Wreck. In fact, I'd probably hire someone to cook for me, despite the fact I can actually cook. Who needs that kind of pressure? Now, my list isn't the usual suspects like The Dalai Lama or Cleopatra. As incredible as it would be to chow down on some grubbage with The D-Lama, I personally love a little banter with my beef. And Cleo? C'mon friends, girl was a diva. She would probably criticize everything that was served and ordered me to death as she grabbed a goodie bag, smiling on the way out. And Jesus? Well, He's at my dinner table every night anyway. I'm back and forth about one or two and feel I want to set a few place setting for others, but I think these said individuals would bring life, laughs, and great conversation to this dinner party. * James Corden. This guy is absolutely hilarious. Everything I've seen him in is pure brilliance. (Google Gavin & Stacey, watch a clip of him as Smithy). He would for sure bring laughter to this group. For that reason alone, he's earned a place at my fictional dinner party. * Tina Fey. Obvi. She's funny. She's smart. She's talented. A no-brainer. * Harry Styles. His accent. His face. Damn. He's gorgeous. I don't care if he's like only 20. The boy is fine. And he used to work in a bakery. It was meant to be. * Nigella Lawson. Let me start by saying that I can never understand why folks want to invite chefs or cooks to their imaginary supper. Seriously, why….WHY would you want to put yourself through potential scrutiny? We've all seen shows like, 'Kitchen Nightmares'. You are only setting yourself up for disaster. Howevs, Nigella seems a bit different. She's the kind of girl that opens the fridge at 1am and does a two-fingered swipe right into the chocolate mousse and licks them clean. I can get on board with her. And that. * Captain America. For eye candy, of course. I know he's neither dead nor alive, so shut it. Remember, this is my dinner table. My fantasy. My delicious, lip-smacking, red, white, and blue, hello sailor fantasy. I have never been the kind of gal who is into muscly guys, but for some reason, this superhero makes it work. Really well. And to round the evening off, I would serve this for dessert. Probably with a few bites taken out. And probably a nibble or two out of Captain America as well. I'll nibble if I want to. Using a food processor, grind Oreos to a crumb state; set aside. Using a fork, blend butter and Oreo crumbs until the come together. Press into a 10-inch tart pan with removable bottom, ensuring the sides and bottom are fully covered. Bake for 5 minutes. Remove from oven and allow to slightly cool. Using a double broiler method, melt butter and heavy cream together. Remove bowl from heat and whisk in both eggs and egg yolks until well combined. Whisk in lemon juice, orange juice, zest, and sugar. Place bowl back over heat and whisk until fully incorporated and warmed through. Pour lemon mixture in prepared crust and bake for 25 minutes or until the middle is set. Remove from oven and allow to cool of a wire rack. 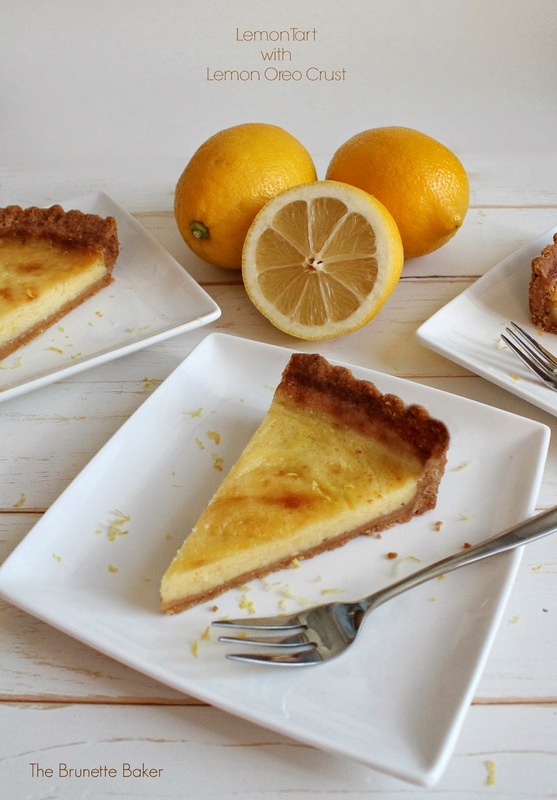 Once tart is at room temperature, place in fridge and allow to chill for several hours. Once chilled, cut and serve as is or with a dollop of whipped cream and lemon zest. Thanks for sharing this with us at our Marvelous Monday Party! Pinning and hope to see you again next week! Lemon is my favorite!! Tina Fey and Nigella? I'm in! And that lemony goodness look delicious!